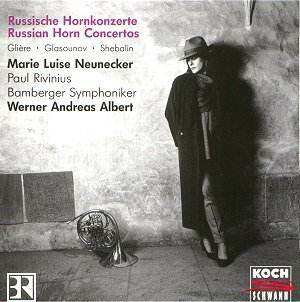 Neunecker has, with minimal publicity, gradually tackled much of the neglected 20th century repertoire for French Horn. Not all that long ago she recorded the Schoeck and Ethel Smyth concertos for Koch. The Gliere was, in the 1950s, made famous within the USSR by an LP of the composer directing the Bolshoi orchestra accompanying the dedicatee, Valery Polekh. The Concerto radiates old-fashioned sun-warmed Germanic romanticism courtesy of Schumann and adds to the 'soup' a measure of Tchaikovskian delirium. The 'Hollywood' sentimentality of the strings at 3.55 in the andante is as close as you can get to Korngold without being Erich Wolfgang. The cadenza in the long Allegro (I) is a conflation of Neunecker and Polekh. The 'troika' allegro of the finale is straight out of Prince Igor. It is pleasantly poetic rather than outright compelling although there are some commanding moments (5.30) in the finale. Pleasant poetry also sums up the neatly rounded little pieces for horn and piano. Rivinius's pianism is extremely sophisticated in its moment by moment responsiveness to the horn. The music is in style with the Rachmaninov preludes. Glazunov's three pieces are most lovingly done. These are fragile, musically speaking, and only the most sympathetic culture will allow them to speak as they do here. The Reverie must surely have taken the famous horn solo from Tchaikovsky's Fifth as its point of departure in much the same way as the Serenade relates to the second movement of the Fourth. The Idyll is a seven minute andante. There are no abrasive edges to Neunecker's playing and she is ideally partnered. Shebalin is rather well represented on the excellent Olympia label where one collection includes this Concertino alongside a number of other substantial works. This is much better recorded and an antidote to romantic noodling. Although it certainly has its share of 'waldlied' it is also lively and even pungently vehement (cf Walton's Scapino). Shebalin was condemned for formalism in the late 1940s and stripped of his academic posts. The silver-threaded lyricism of this music implies a sort of Soviet John Ireland although the finale is closer to de Falla and Shostakovich. This is a first class collection which is obscure only because its virtues have not been 'trumpeted'. Koch seem to get precious little attention in the media. Neunecker is a musician of outstanding musicality and technical brilliance. Snap it up while it is still available.